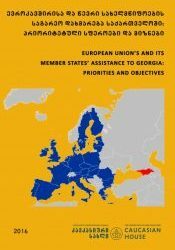 Today it is common to ascertain that unlike most of post-socialist countries Russia has chosen a non-Western path towards development after the collapse of the Soviet Union. Many tend to forget that the Russian elite backed up by the Western support, embarked on reforms based on the Washington Consensus. These very reforms have contributed to shaping the logics and nature of Russia’s capitalist development as of today. 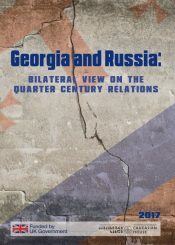 Modern Russia, constructed as a result of neo-liberal reforms is very unlikely to fall under a core countries category (according to the world-system theory) as it is better suited to a status of semi-periphery, or as Kagarlitsky puts, to a very flexible status of ‘the empire of the periphery‘ (B. Kagarlitsky 2008). In order to fully understand the nature of the modern Russian oligarchic state, one needs to observe an actual process of the development of capitalistic economy which is essentially different from liberal teleology. 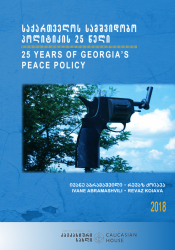 The goal of the present paper is not to produce something entirely original, rather, it represents a humble attempt to provoke a debate on so called transition theory which the post-Soviet Russia (as well as Georgia, however, we are lucky Georgia does not possess oil resources) has turned into practical experience. 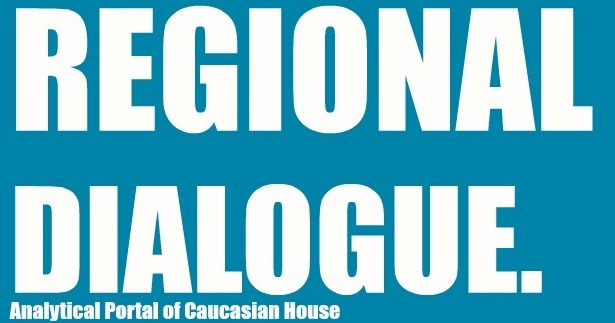 It should also be noted that analysis of the regional development and literature review from ‘non-mainstream’ perspective is quite rare in this part of the world. 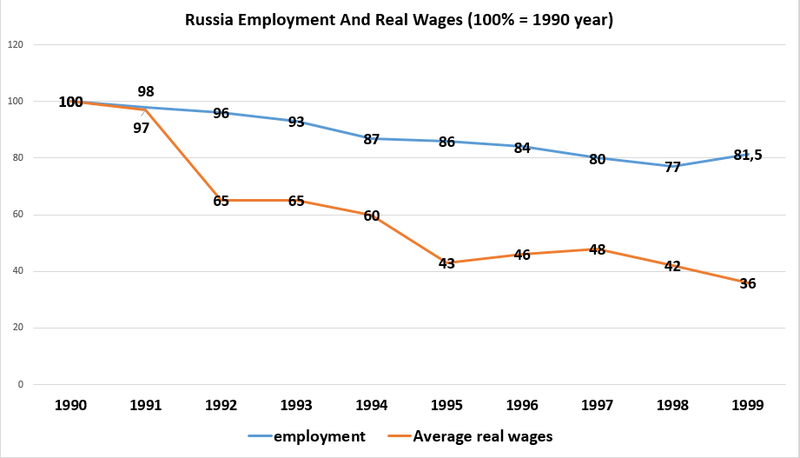 The ultimate collapse of the Soviet Union had brought about the need for reforms which would incentivize the integration of the Russian economy with that of the capitalistic world. Consultations held by then President Yeltsin and Gaidar with Jeffrey Sachs, World Bank and International Monetary Fund resulted in a shock therapy program the theoretical foundation of which considers the market a self-regulatory system which in term, is capable of rationalization and the transformation into a dynamic economic organization once political obstacles are removed. The model suggests that freedom of market, protection of people and private property are good enough conditions for the generation of dynamic capitalism from overwhelming aspiration to personal interests. For proponents of this very model a preceding system (feudalism in Smith’s case while socialism for reformers) represents a barrier to changes and therefore, they need to be destroyed for the new system to emerge from parts liberated as a result of destruction (Clarke 2007). Shock therapy uses privatization, deregulation, price liberalization and free trade as its most powerful tools. The ultimate goal of these instruments is to diminish the State’s role and get economy back to its ‘natural order’ which, in turn, implies restoring a balance between demand and supply through price liberalization. The theory suggests that privatization and deregulation incentivizes firms through stimulating private profit and encouraging competition which then leads to greater efficiency and reducing costs. Sadly, outcomes of such efforts appeared to be far worse than initially anticipated by ‘reformers’. In the end of the day instead of rationally functional businesses and innovative entrepreneurial aspirations promised in abstract economic literature, end product consisted of ‘gangster capitalism’ and half-criminalized predator economic elite, which had to resorted to violent means of appropriating economic resources in the process of privatization. At the same time, the whole economic structure had acquired forms of classic colonial economy with a major focus on the export of raw materials. 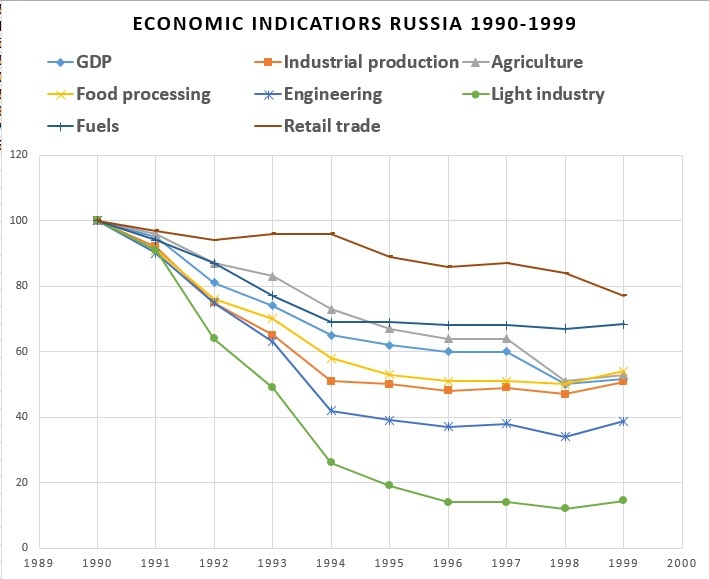 Inflation which struck aftermath the price liberalization had destroyed capital of Russia’s enterprises while dismantled administrative-command system left them without investment funds. Devastatingly, restricted financial policy resulted in increased credit price which led to the overvaluation of ruble’s exchange rate (see B. Kagarlitsky 2008).. Introduction of international trade opened a way to cheap imported goods and commodities to the Russian market while unregulated privatization made it possible for criminal elements to get hold of the most valuable of the state assets (S. Clarke 2007). In fact, the privatization process was none other than the transformation of political capital owned by former Soviet bureaucrats and underground elites into economic capital. By 1993 the leadership managed to stabilize the inflation rate to some extent as a result of the reforms. Under such conditions ‘the exporting of raw materials was now combined with support for an overvalued ruble. The important consideration was not the needs of Russian industry, which was being smothered by this policy, but the interests of raw materials exporters. For them, the decisive factor was not the ruble exchange rate, but the world price of oil. Russia was inundated with cheap imports, and local industry, unable to withstand the competition, was expiring…The privileged layers could purchase luxury items at advantageous prices, while also sending money abroad. The largest exporters were at the same time the owners of the main banks, which invested money in financial operations, the exporting of capital, and the importing of goods.” (B. Kagarlitsky 2008). As Andrey Kolganov puts it ‘the outflow of capital exceeded in numbers all foreign investments and debts that Russia had received on numerous occasions during the implementation of the reforms”. According to Clarke, by 1997 annual capital outflow ranged from 20 to 25 billion constituting 5 per cent of GDP and exceeding by five times total foreign inward direct investments. Lack of resources is not the only contributing factor to scarce investments as there are great many social-economic variables as a result of which increase in savings (profits) cannot be automatically transformed into investments. In spite of availability of resources, internal production failed to develop. Had there been a radically different scenario the State would have developed into a ‘capitalist of the last instance’ and effectively distribute resources with the purpose of attaining long term economic development. GDP (at constant prices) was halved between 1990 and 1998, while both agricultural and industrial production fell by half. Production of fuels fell by one third and retail trade turnover fell by almost 20 per cent. Food processing fell in line with the rest of industry and the output of light industry declined by more than 80 per cent. 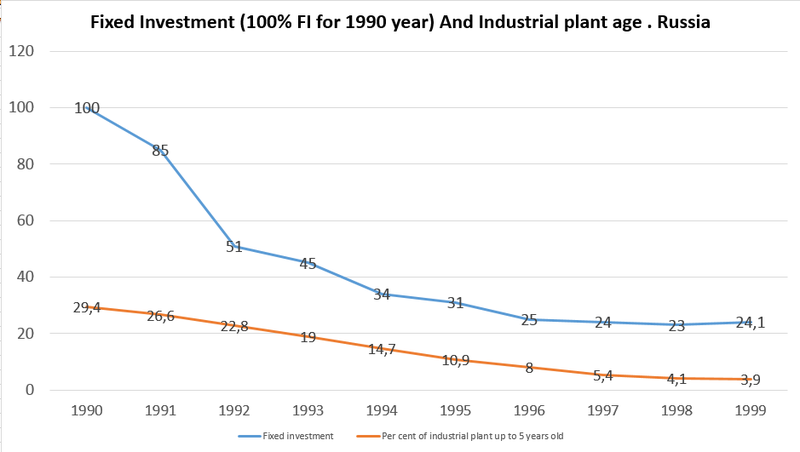 23 per cent of foreign direct investments between 1994 and 1999 (average three billion per annum) went to oil and metallurgy, 20 per cent to trade and catering while 15 per cent ended up in food processing industry (S. Clarke – 2007). Economic downfall was further exasperated by setback in investment, a ramification which also affected industrial equipment. The average age of industrial plant and equipment in the late soviety period was about nine years but by 1999 it had increased to over 18 years. Instead of decreasing costs by applying to innovative production methods, enterprises instead chose to do so by intensifying labor and cutting actual salaries. Most of enterprises were engaged in non-profit activities and involved in barter transactions (see Clarke – 2007). The collapse of the economy was reflected in the decline in employment and wages. Total employment fell by over 20 per cent, with employment in industry falling by 40 per cent, construction by 44 per cent, and science by 54 per cent. Interestingly, employment in credit and finance increased by 80 per cent from a very small base. By 1998 wages had decreased by one third of what were real wages in 1990 (S. Clarke – 2007). The review of a situation in wages in 1999 yields that 41 per cent of hired workforce earned less than a living minimum for an adult person. Reportedly, more than a third of households lived in poverty while 10 per cent suffered from living in an abject poverty. 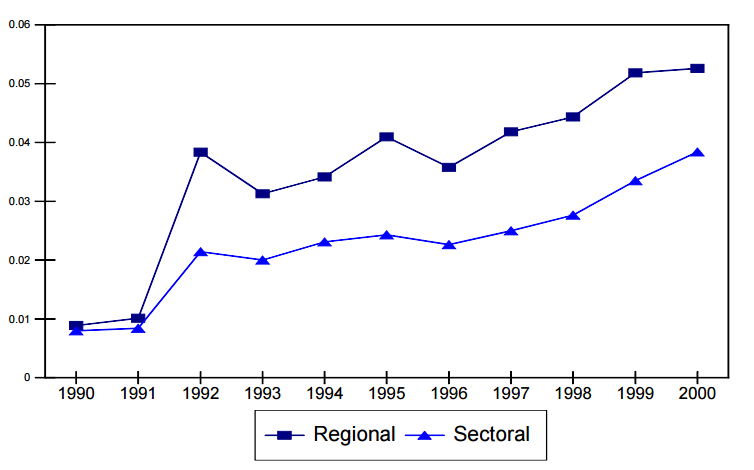 Regional and sectoral inequality had increased, a trend that Russia shared with the rest of post-Soviet space. A Gini coefficient (measuring inequality in income) went up from 0.24 to 0.48 by 1994. Surely, the reformers had not made any promises that the processes would have been painless. However, the transition to the market economy, they argued, would make everyone content in a short-term perspective. Sadly, only the first part of the promise was ultimately kept and the ‘shock therapy’ turned into a pain without any remedy whatsoever. Pleae refer to James K. Galbraith, Ludmila Krytynskaia, Qifei Wang. The European Journal of Comparative Economics Vol. 1, n. 1, pp. 87-106). There was no bourgeoisie in the Soviet Union and therefore, nor was there accumulated capital in a monetary form. Nobody could purchase means of production in the privatization process. Instead, there was a powerful hierarchical system marked distinctive polarization of political, cultural or social capital. Because of these reasons, a new economic elite emerged from ‘a combination of elements of underground Mafiosi, the nomeklatura and intelligentsia’ (Holmstrom and Richard Smith – M.R.2000). Of course, the rivalry between them was nothing like ‘Western capitalistic (abstract) competition, something that neo-liberals failed to consider as they perceived a cataclysmic process of social transformation as individual emancipation and self-determination. As Holsmtrom and Smith argue, the “Primitive accumulation” do not look nice either in the past nor in the present’. Profit of the new economic elite originated from market transactions without having much to do with production. Oligarchs developed themselves as financial mediators of some sorts, who would purchase raw materials at low price at a local market and profit from the export. When ruble devalued vis-à-vis the dollar, they would exchange dollar for ruble and then lent ruble with very high interest rate only to exchange rubles they received for dollars, thus making huge profit. Other speculation schemes were used under a high inflation mode. Part of oligarchs manage to set up banks and engage in their favorite activities of speculating with and seizing public assets. Two financial schemes known as ‘theft of the state’ and ‘loans for shares’ were introduced from 1995 and stayed on till 1997. Thanks to these schemes a consortium of seven Russian banks made loans to theRussian government against a pledge of state shares in some of the largest industrial complexes in the telecommunications, metallurgical and oil sectors (please refer to H. Buiter. 2000). 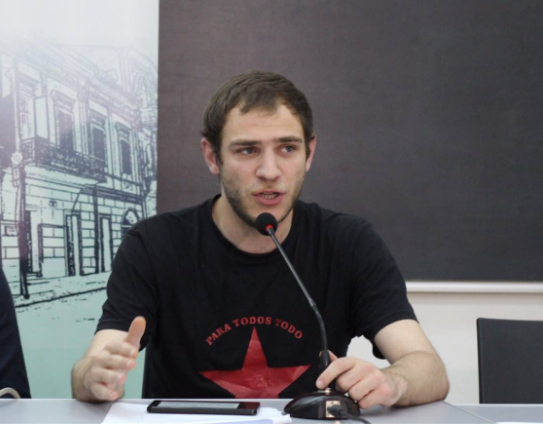 A sociologist Michel Burewoy characterizes the Russia of 1990s as merchant capitalism under which the source of profits is based on trade, speculation, gains from differences between international prices rather than on the transformation of production and investments. Burawoy argues that merchant capital develops independently from production capital and it has no internal energy to transform itself into industrial capital. Even more so, merchant capital has no capacity to transform outdated production mode. Instead, it needs to sustain this mode as a pre-condition of its own existence. Therefore, a dominant economic order in Russia cannot self-modernize itself due it its conservative nature. Nor can external pressure or foreign capital play the role of a transformer as they are partners with local conglomerates striving to bring in Western consumers good and extract raw material. “As in the Third World, foreign capital enters in the form of merchant capital and thereby deepens underdevelopment because it leaves production largely untouched” (Kay 1975, particularly chap. 5). The theory suggests that a full societal capitalist transformation is based not on the development of the market (which historically precedes capitalist mode of production) or market transactions, but on penetration of capital in industrial sector and transforming it from within. Traditionally, capitalism originates in feudal societies in the process of industrialization whereby peasantry transforms into free laborers in light of accumulating industrial capital. However, these processes had already been led by a socialist state which facilitated the industrialization and massive involvement of peasantry in industrial workforce. This is exactly where historical specifics of post-Soviet capitalism lies: capitalism originated not from a feudal society but rather from a complex industrial-socialist state, where the state’s militaristic apparatus itself led to accumulation and distribution of surplus. Existing contradictions within the system had ultimately led to the disintegration. 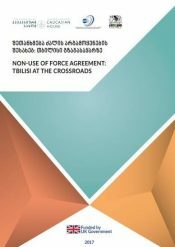 It is evolutionary dynamics that provide an angle for scientific study of post-Soviet disintegration and its further development. This approach should be given a priority over a theory of ‘teleological transition’ according to which reality is subordinated to goal and free market idealization (or abstraction of the free market) should be used to analyze norm and abnormality. Nowadays reformers and liberal theoreticians tend to criticize the failed reform. today reformers and liberal theorists criticize the failed transformation, but their criticisms depends on to call “external causes” to unforeseen elements of their own theories. This is reflective of their attitude: if the reality does not fit the theory, it is the reality which is ‘flawed’ not the theory. The shock therapy prescribed by the end of the century and a neo-liberal policies culminated in the economic crisis of 1998. A boom due to increasing oil prices aftermath the crisis had in its turn resulted in economic revival and political changes ensued. These changes will be discussed in the second part of the paper. Joseph Stiglitz, Globalization and its Discontents. Refer to the chapter: Who lost Russia. See: to From Predation to Accumulation? The Second Transition Decade in Russia Willem H. Buiter. Schumpeter’s ‘creative destruction’ theory describes a permanent revolutionary process, which changes the economic structure from inside, constantly destroys the old and creates the new (www.investopedia.com)’. Schumpeter argues that capitalism is a dynamic evolutionary economic system which moves from disequilibrium to disequilibrium through innovations. Heroic ‘naterpreneur’ is an agent of innovations. This process represents a danger as it makes people losers and winners and brings about severe flactuations in economy destroying the old conditions for profits and creatingnew ones. Interestingly, Schumpeter rejects static equilibrium which, is an inheret precondition in reforms authored by the shock therapy supporters. Distancing Prime Minister Primakov from power can serve as a good example. The question will be discussed in greater detail in the second part. The Necessity of Gangster Capitalism. Primitive Accumulation in Russia and China by Nancy Holmstrom and Richard Smith – Monthly Review 2000 › Volume 51, Issue 09 (February) . Burawoy and Krotov, ‘The soviet transition from socialism to capitalism’ American Sociological Review, 1992. Vol. 57 (February: 16-38) . Globalization and its discontents. Joseph Stiglitz, Radarami.